Since the documentation was a bit sparse on my script in my previous post, I thought I’d post clearer instructions, for those not as familiar with Group Policy. This post is going live with my guest Tech Segment on PaulDotCom today. For this implementation guide, I assume you have an Active Directory domain and several clients to manage. You’ll also need to do your work from a machine with Group Policy Editor, and either the correct delegated permissions or Domain Admin privileges. If there are any instructions that are unclear, leave a comment and I’ll update the post. Please download the randomize-local-admin.vbs script from my GitHub (right-click, Save Link As…) and save it your Desktop or another accessible location. You’ll need this shortly. 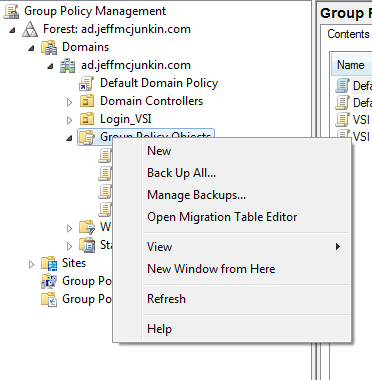 Open up Group Policy Management Console, browse to the Group Policy Objects folder, then right-click on it and create a new Group Policy Object. Name it something recognizable such as “Local Administrator Password Randomization”, then right-click and Edit it. 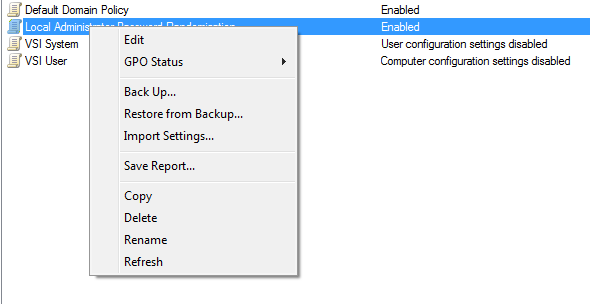 Now browse to Computer Configuration -> Policies -> Windows Settings and double-click on Startup. This is where we’ll set the script to run on boot. Once the new window pops up, click Show Files to open the GPO’s directory and copy the VBScript (randomize-local-admin.vbs) inside. Make sure it has the right extension, or Windows won’t recognize it as a VBScript. 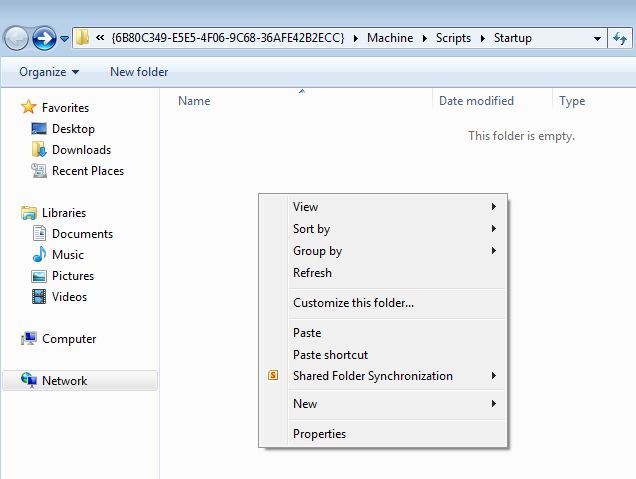 Now add the script to the Group Policy Object by clicking Add and selecting the script. The intent of this script is to randomize local Administrator accounts on desktops and member servers, but domain controllers don’t have local accounts. So as to not randomize the builtin Domain Admin account, we’ll need to exclude DC’s, either via the Organization Units (OU’s) we target or by WMI Filters. 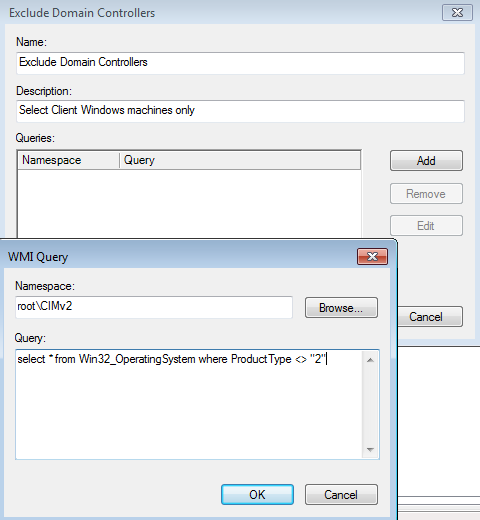 If your Active Directory OU structure isn’t built with separate areas for Domain Controllers, or you want to link the entire domain, we can use a WMI Filter to exclude all machines classified as DC’s. Now that we’ve created the GPO and its WMI Filter, we can link it to an Organizational Unit. 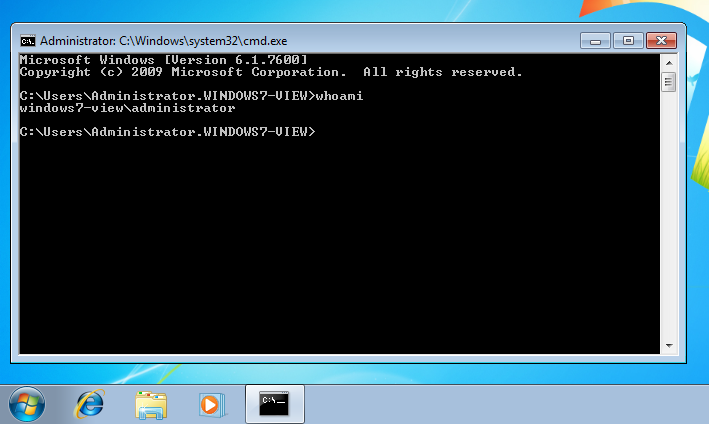 First, though, you’ll need to associate the WMI filter if you created one. After clicking on the Group Policy Object, select the WMI filter from the lower side of the right pane, under WMI Filtering. Right-click an existing OU which has systems you’d like to target and click “Link an Existing GPO…”. Select the GPO you just created, and it will take effect on the next reboot on all Computer objects in that OU. You can select other OU’s in the same way. To make an acceptable level of overkill, this script creates 120-character passwords using the full ASCII character set (1-255). Again, if you have any issues feel free to leave a comment or send me an email. What to do with the local Administrator account? After my last post with the local Administrator randomization script got some attention from John Strand (@strandjs), Tim Medin (@timmedin), and Tim Tomes (@LaNMaSteR53), I realized the issue what to do with local Administrator accounts was considerably more complicated. Here’s my attempt to map out the different possibilities. As background, be sure you know that resetting a local Administrator (or bypassing it entirely) is trivial given physical access to a machine (via NT Password Reset, Kon-Boot, or similar utilities). Offline registry attacks assume there’s no drive encryption in place. The two types of attackers I’m assuming below are external (as in a penetration tester or malicious hacker) and internal, as in employees or contractors. I assume the external attackers don’t have physical access to each machine in the domain, as that would defeat any of the recommendations below. Standardized local Administrator password on all domain-joined machines. While convenient, this is a horrible idea security-wise. Brief physical access to any domain-joined machine to acquire the hashes gives Administrator access to all machines in the domain via passing the hash. Though this is exactly what I’m trying to combat, it’s a likely situation in many shops. Some will mitigate this slightly by having a different desktop password than the server login, but that doesn’t help for long. At some point, a Domain Administrator will be logged on to a desktop, and stealing his/her token will result in Domain Admin privileges. Please, please don’t choose this option. 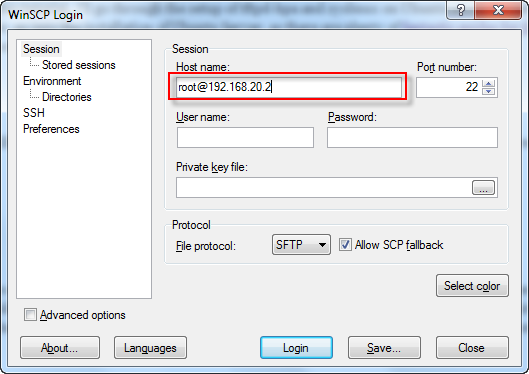 Standardized on a local Administrator password, but also set SeDenyNetworkLogonRight on that account. Make sure to still set a reasonable length (15+ characters) password on that account. In this situation, any employee who was told this password (say, a remote laptop user) could then abuse that privilege on any machine he/she can get physical access to until the password is changed. I’ve been to many places where the local Administrator “break-glass” password is fairly common knowledge among end users. I urge you to not choose this option, either. Individualized (not randomized) local Administrator passwords. Set SeDenyNetworkLogonRight for the local Administrator as in #2, but also include individual passwords for each machine. This prevents a single password having rights throughout the domain, but adds complexity. I don’t know of any shops going this route, but it seems reasonable. Randomized local Administrator passwords. Setting SeDenyNetworkLogonRight should be unnecessary, but is a harmless additional precaution. This was the focus of my previous blog article. In order to use the account at this point, you’ll need to either reset the password using NT Password Reset (or similar), or bypass it entirely using Kon-Boot. Do note that this is the same method an attacker would use to get local Administrator privileges. Disabling the account is optional, but precludes Kon-Boot (which bypasses the password, but respects whether or not an account is enabled). The biggest downside I’ve experienced thus far is the lack of a way to help a remote (i.e., not domain-connected) user who needs administrative access to their machine. Do you need to access machines remotely using the local Administrator account? Since we’re discussing domain-joined Windows machines, the use cases for this requirement are small. The two situations I see this need are machines that aren’t connected to the domain (assuming Domain Admin credentials aren’t cached, which is a topic for a different blog post), and accessing machines that are infected or untrusted (as the domain token could be stolen and re-used elsewhere). If so, be careful! This is where most people get into trouble. Standardizing on a local Administrator password means that anyone with brief physical access to any one of those machines can use those same credentials (without cracking the password hash, even) on all machines in the network. If this is both scary and new information, look up “Pass the Hash” attacks. If you’re still sure you need remote access to machines using the local Administrator accounts, you’ll need to ensure the same password isn’t used across all machines in your domain. In other words, we’ll need to make those passwords individualized to each machine. These individualized passwords can be created using the output of a hashing algorithm seeded with some unique identifier of the machine together with a secret padding. If we can guarantee the padding isn’t disclosed, we’ll have a fairly secure password. The output of the SHA-1 algorithm is 160 bits, expressed as 40 hexadecimal characters. Plugging that output into Jason Fossen’s password complexity spreadsheet gives us an output of 1,157,804,805,602.22 years to crack an average password of that length directly, with 1,000 machines each generating 200,000 hashes per second. Needless to say, an attacker would be far better off trying to discover the method used to create the passwords (including the secret padding) than to attack each password individually. The biggest concern for individualized passwords is setting them. My preferred approach, Group Policy, would show the secret padding, as it would have to be in the script. Accordingly, we’ll need to push out the individualized passwords from a trusted computer, setting the passwords on each remote machine. Unless I get requests otherwise, I’ll leave the actual individualized password script as an exercise for the reader. Amazon has just posted my five-star review of Top-Down Network Design (3rd Edition). Whereas most other networking books focus on one technology or one aspect of network design, Oppenheimer really does guide the reader through designing a network in a top-down (gathering requirements to documentation) fashion. Overall, the book takes you from a 30,000 foot view to about a 2,000 foot view. Despite Oppenheimer’s Cisco-focused background and being published by Cisco Press, her book admirably avoids plugging Cisco as the end-all-be-all solution. Overall, I would recommend this book for all parts of network design, and recommend others for the actual IOS/device configuration (which Top-Down Network Design avoids). As others have identified, the books is divided into four sections. The section titles are descriptive enough, so I’ll just point out the highlights by chapter instead. The first chapter covers an introduction to network design, including analyzing business goals and constraints. It emphasizes the need for the network design to make “business sense,” as in justify the business itself. Constraining the network design to the budgetary and staffing constraints of the customer is also important — after all, what good is a highly-reliable, highly-complex network to a CCENT-level network engineer who can’t make necessary modifications without taking down the network? The fourth chapter relates to the network traffic of the existing network. By categorizing users into “user communities” based off job role (usage of sets of applications) and categorizing the traffic flows themselves, one can describe at a high level the network flow while still providing useful data for technical purchase decisions. The traffic flows are categorized into groups such as peer-to-peer, client/server, server-to-server, terminal/host, and distributed computing.The traffic is also displayed by frame size, broadcast/multicast/unicast type, and error rate to give useful data. QoS requirements for voice and other sensitive applications are also discussed, as are different service categories based off the Asynchronous Transfer Mode Forum definitions. I appreciate this model, as without these abstractions it’s tough to talk about network flow at a high level without losing specificity. In chapter six, there’s a sizable section on naming schemes, especially in the Windows world. The “Guidelines for Assigning Names” section is full of solid advice, though the section on WINS can probably be safely removed in the next edition. Chapter seven is mostly focused on the actual switching and routing protocols, but also covers the creation of decision trees to assist with protocol selection. Table 7-5 on page 230 is a *very* handy summary of the routing protocols covered in the text. In the last chapter, number 14, Oppenheimer gives a summary of top-down network design by going through the steps of the design methodology, which I found very useful. She also highlights the importance of the network design document, details how to respond to client RFP’s, and then goes over the sections of the network design document in detail. I found this to be an extremely useful book for its intended purpose. Top-Down Network Design will be a text I refer to for any network design needs I encounter in my future. Full disclosure: I do know Priscilla Oppenheimer. I have taken several classes from her in networking and network forensics.